Raunaq Singh was desperate. It was almost midnight and the toy store would be closing soon; this was his only chance to get what Kevin wished for this holiday season. Raunaq works for Opendoor, a tech company reinventing the home buying and selling process, and they had graciously volunteered to give gifts to families of Mercy Housing California’s Bill Sorro Community. A seemingly easy gift — a firefighter costume — was sold-out online and in every nook of storefront in the Bay Area. Raunaq had been randomly selected to get four-year-old Kevin this gift and he didn’t want to let him down. During the holiday celebration at Bill Sorro, Kevin saw the helmet of his coveted costume peeking through a tiny tear in the wrapping paper. Kevin’s smile radiated joy and astonishment, giving Raunaq a much-needed sigh of relief. His exhausting search for the gift had spanned the entire San Francisco Bay Area, and the fruits of his efforts were finally realized—a happy holiday for residents of the Bill Sorro community. Opendoor staff had tirelessly gathered and wrapped roughly 50 presents for the residents’ wish lists which included diapers, toys, and of course, Raiders’ jerseys. 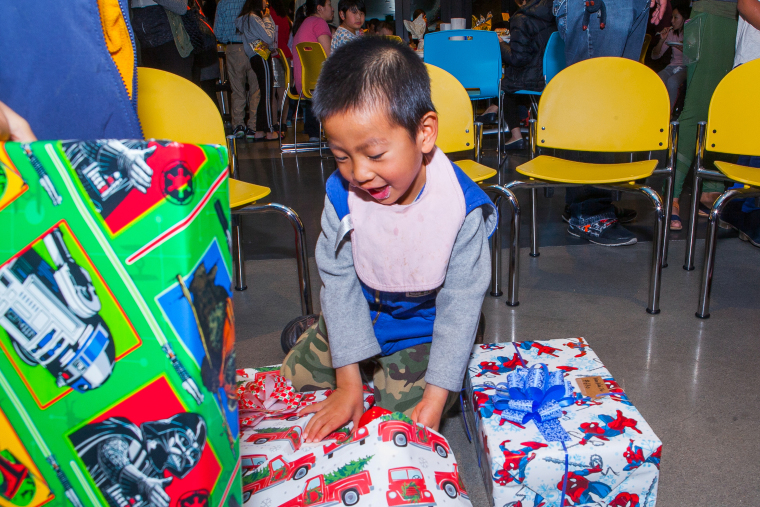 At a recent holiday celebration these San Francisco-based families were offered gifts, as well as peace of mind. Sharing the holiday with people and an organization that deeply cares for them gave them a warm sense of inclusion and acceptance in the heart of a busy and rapidly changing city. We are incredibly grateful to the 50+ volunteers from Opendoor who helped make this holiday season magical for Mercy Housing residents!